Want a quick and easy way to grow your email list? This post takes you through how to include a mailing list signup checkbox on your contact forms. Growing your email list is one of the simplest and most effective ways to boost your conversion rates. It’s a highly targeted way to promote your business. It also keeps people updated and interested in your brand. However, building an email list and convincing people to sign up can be hard work. That's why it's important to make it as simple as possible for them to do so. A quick and easy way to grow your email list is encourage people to sign up while filling out your contact form. Making it almost effortless to sign up can really boost your numbers. So, adding a MailChimp signup checkbox can really help. In this post, we’ll walk you through the simple steps you need to take to add a MailChimp opt-in checkbox to your forms. The first step is to create a new contact form. Our Contact Form template will save you time and gives you a basic template that you can customize if you wish. 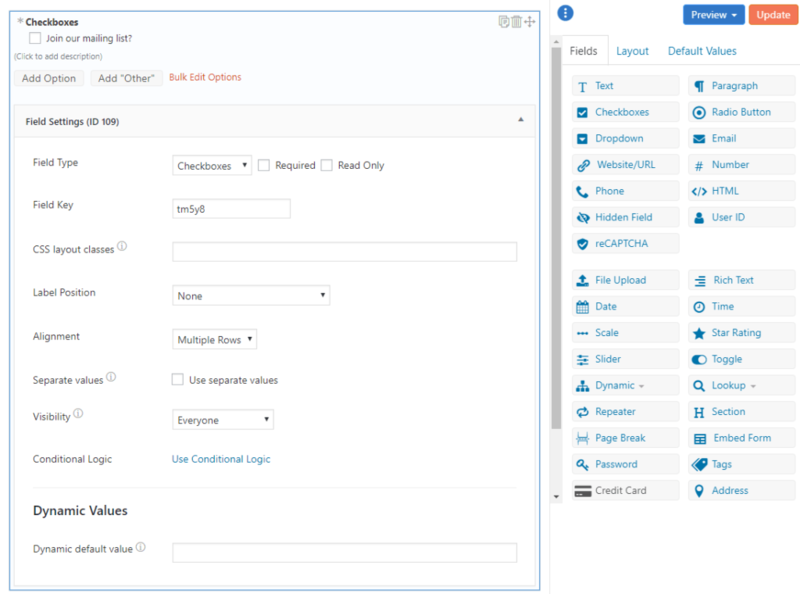 The next step is to link your MailChimp account with Formidable Forms in WordPress so that we can access it. For a step by step guide on how to do this, take a look at our post below. 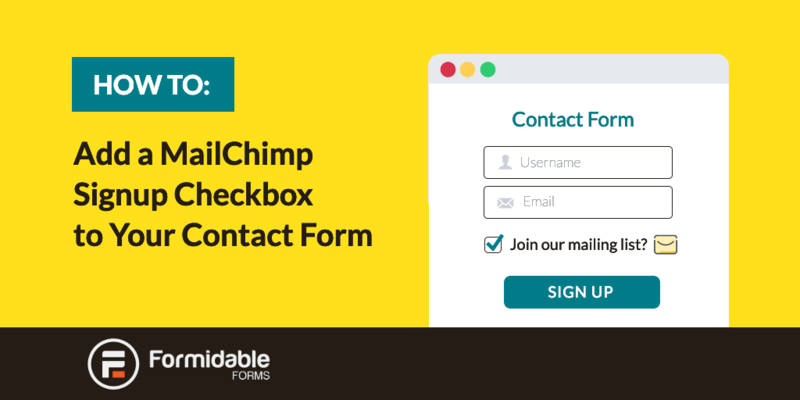 Once you've set MailChimp up, it's time to add it to your contact form. 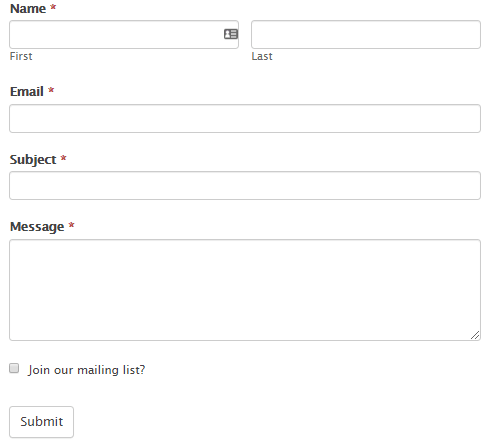 To set this up, go into Form Settings > Form Actions > Add to MailChimp. Adding a checkbox is as simple as clicking on the 'Checkbox' field in the fields list on the right. You can rename your checkbox field and include multiple options if you wish. As we're dealing with a mailing list opt-in checkbox, it's best to have just one option renamed to something like 'Join our mailing list?'. As you don't really need a title to this field, put the Label Position to 'None' so it's a bit cleaner. You'll need conditional logic to work behind the scenes to ensure that only people who check the box are signed up to your mailing list. Conditional logic just means that the next step is triggered, only if specific conditions are met when the user filled in the form. So the next step triggered in this case will be a confirmation message that your email address is added to the mailing list. You'll need to make use of the MailChimp form action you created in step 1. Go back to Form Actions and click on the 'Add to MailChimp' section. Change the default settings to the ones shown above and you'll be able to add users to MailChimp, but only if they tick Yes/tick the checkbox. The final step is to check that everything works. Do this by publishing your contact form and fill in some details as a test. Just make sure you use a different email address than the one associated with your MailChimp account, as this won’t send a subscription confirmation. Now you're all set up with a MailChimp checkbox, the next thing to do is build your email list. The checkbox will certainly help, but you've still got to provide great content and an incentive to stay subscribed. Take a look at our post on how to create an email list for your WordPress blog. This will take you through all you need to know to get your email list up and running. In no time, you'll boost your conversions and increase sales! See our documentation for further information about using MailChimp with Formidable Forms. Not yet signed up to Formidable? Take a look through our wide range of intuitive features to find out exactly how we can improve your website's effectiveness.